I could hear this verse ten times a day every single day and it wouldn't be enough. Worry and fear, those are often my pitfalls. I begin looking at a situation or a choice and obsessing over it, trying to figure out what I can do about it and turn my eyes away from God. It is an easy slip that I didn't notice for a long time. Do you do that too? Do you get so focused on the circumstances that you forget that God has it all under control? You are not alone! Matthew 6:34 is one of the verses God gave me to resist that particular temptation. I realized that much of my distraction was simply worry and I was worrying for absolutely no reason. 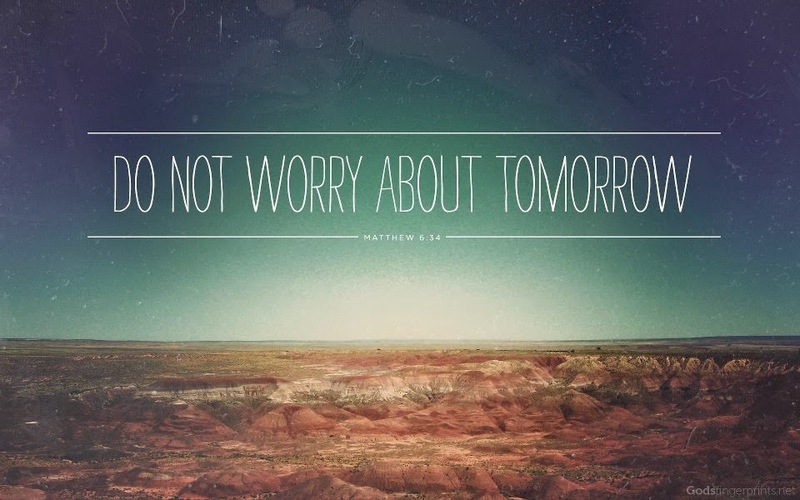 Don’t worry about tomorrow because today’s trouble is enough for today -- that is without a doubt truth. The thing I finally came to realize is this -- we can only affect the present, this moment, today. We can’t do anything about tomorrow or yesterday, but right now we can do something about. Once I had this revelation, I began to understand. God is above and beyond time -- he can affect any part of it He wants. However, I am bounded and limited by time. Even if God changed the future, I would never know it until later because all I can see is right now and I would still be worried about the outcome. God is linked to us directly, but only in the present moment. Only in this minute span of time can God touch us and affect us. Instead of worrying about tomorrow, pray for peace today. Don’t worry about tomorrow because there is enough going on right now that you can actually do something about. Every moment brings a choice, you can worry and doubt God’s ability or you can have faith that God has everything under control and concern yourself only with what you can affect right now, this moment, today.